Kingdom Hearts III co-director Tai Yasue was recently interviewed by Game Informer's Kimberley Wallace during his visit at the Game Developers Conference this past week where he discussed about the difficulty level of the game as well as Final Fantasy characters and the best moments within Kingdom Hearts III. You can check out some excerpts from the interview below. THE INTERVIEW DOES CONTAIN SPOILERS, PLEASE BE ADVISED! You can check out the entire interview by clicking here. Yasue did give a hint that critical mode will be coming to Kingdom Hearts III in a comment earlier in the week, though he hasn't given much more details. What do you think of this interview? Let us know in the comments below! 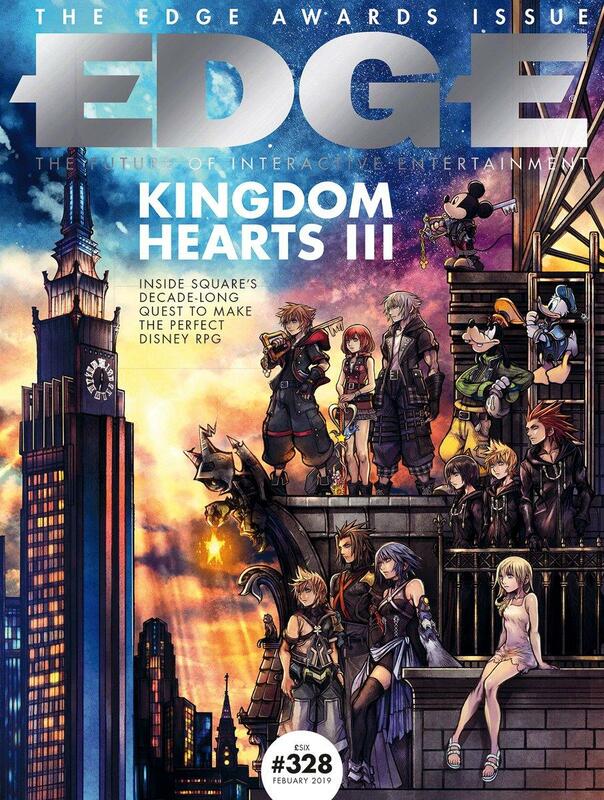 The latest issue of GameRadar's Edge magazine has featured an article about the development of Kingdom Hearts III as a whole through the eyes of Kingdom Hearts director Tetsuya Nomura and co-director Tai Yasue! 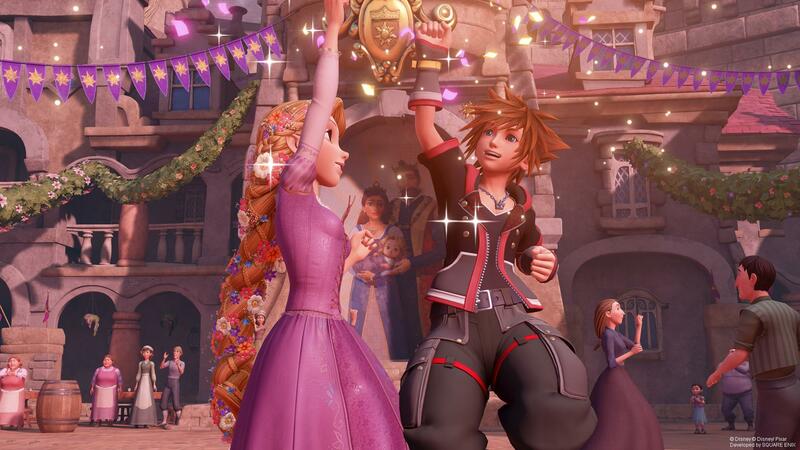 Edge deputy editor Jen Simpkins had the opportunity to talk to both Nomura and Yasue about the beginning of Kingdom Hearts III's development and how switching from Square Enix's in-house Luminous Engine to Epic's Unreal Engine 4 was a difficult task, the importance of Pixar in Kingdom Hearts III's existence, and much more. You can read their comments below. Edge Issue 328 is available now at newsstands and digitally on the Google Play Store. 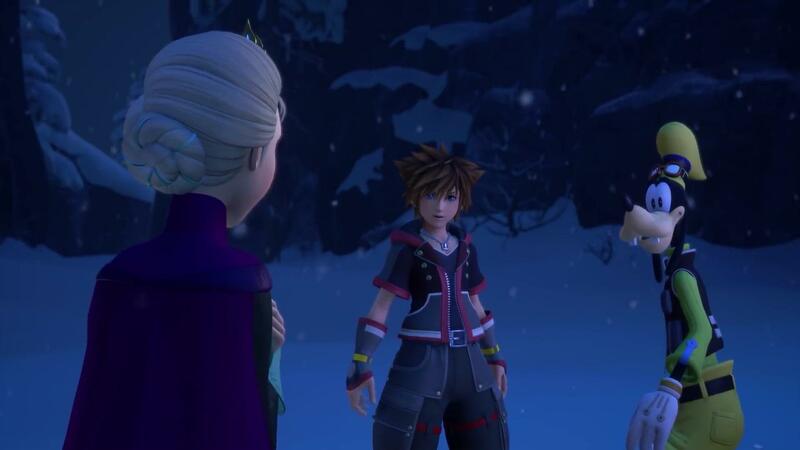 Newsweek have published an interview with Kingdom Hearts III co-director Tai Yasue, who discussed the development of various gameplay elements in Kingdom Hearts III. He started by mentioning how the Kingdom Hearts III team took some time to adapt to the switch from the Luminous Engine to the Unreal 4 engine. In regards to the wall-climbing mechanics, he said this was originally planned for Olympus, but was then adapted to fit into all the worlds along with other Flowmotion-like actions. The idea of using Attractions in gameplay came from brainstorming gameplay that would be unique to Kingdom Hearts and also incorporate a classical Disney experience. In regards to choosing Disney worlds, Frozen and Tangled were picked mainly because they excited the development team, as there are many things in terms of gameplay that one can do with a beheaded snowman or a princess with very long hair. Yasue also gave some examples of the different types of specialists hired to enhance specific parts of the game - including someone to make dandelion seeds extra fluffy! 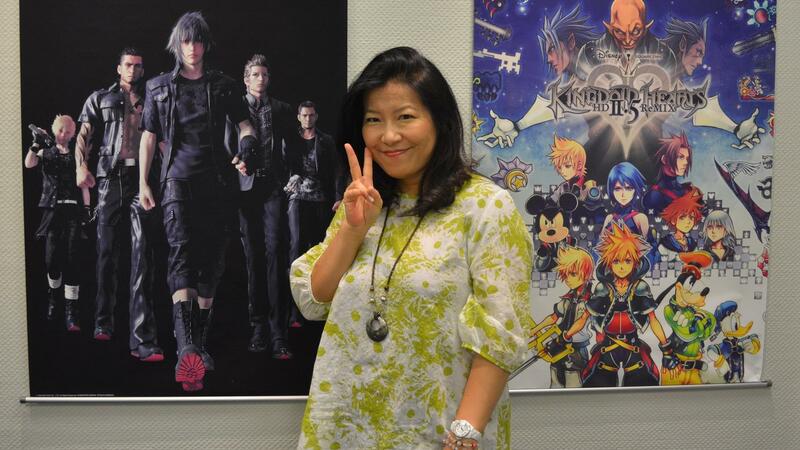 Fans can expect a lot of surprises in gameplay, as Yasue described Nomura as a creative force that took the development of the game to unexpected places. 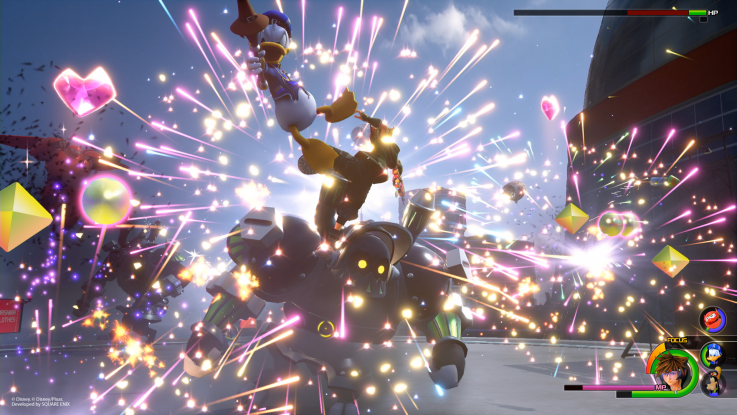 "Sheer scale and accessibility" will make Kingdom Hearts III stand out from any other games in the series; due to its wide variety of gameplay, Yasue described it as a "celebration of gaming, old and new." The feature that will contain the series recap videos in Kingdom Hearts III is called the Memory Archive, which will lets fans, new and old, to catch up with key parts of the story so far. 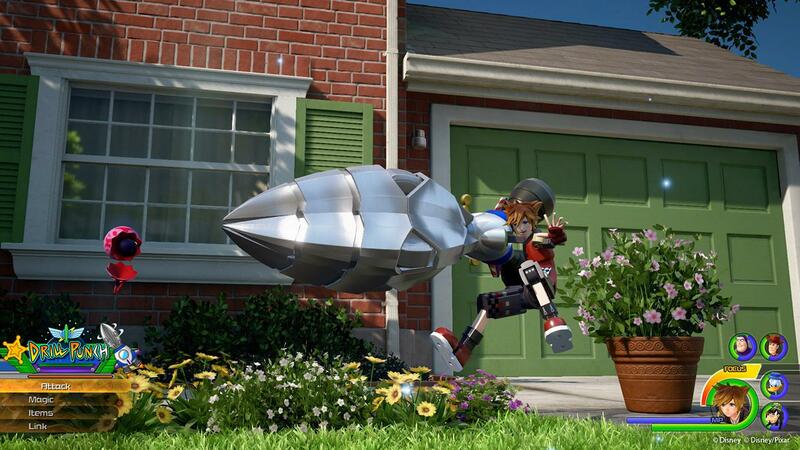 Yasue concluded the interview by stating that the Gummi Ship is his favorite part of Kingdom Hearts III; fans can expect a massive overhaul of this standard Kingdom Hearts mechanic, including a vast universe, more freedom, more Gummi blocks, and unique and interesting skins. Yasue is currently making a ramen stand Gummi Ship that can shoot fireballs. You can read the full interview below. 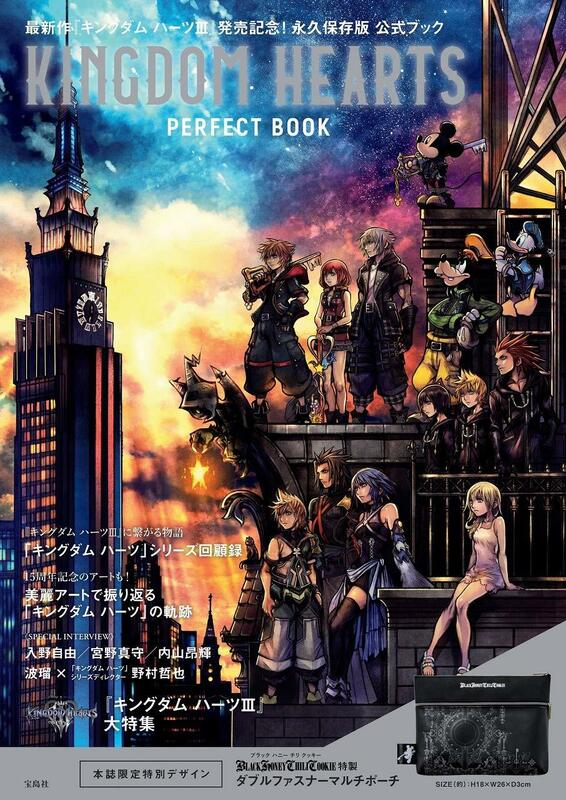 The Kingdom Hearts Perfect Book that was released on December 28th features an interview with Kingdom Hearts director Tetsuya Nomura. We are currently translating the book and will report once we have translated. An excerpt from the interview has been translated already by @aitaikimochii about Nomura's stance on the story. You can read it below. UPDATE [Dec 30, 2018]: The full interview is now available thanks to translations by NihonScribe, Solis, and Mio-chan. 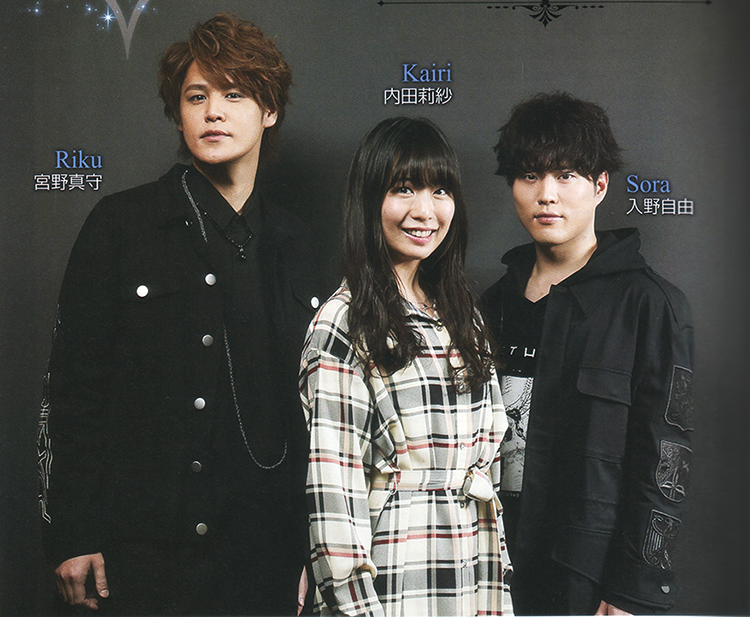 The interview features Japanese actress and idol Haru talking about her history as a fan of the series and her favorite aspects of it, as well as featuring Nomura talking about the future of the series, how Frozen was included in the game and even about the story beyond Kingdom Hearts III. 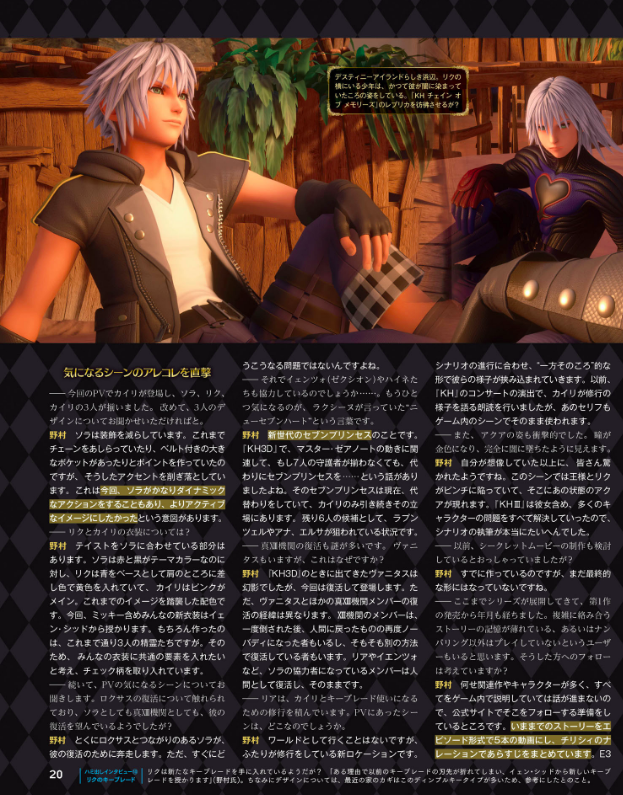 You can also take a look at some scans from the Perfect Book towards the end of the article, thanks to KH13 use @Iarumas ! What do you think about the future of the Kingdom Hearts series? Let us know in the comments below! Famitsu have recently posted their full interview with Kingdom Hearts series director Tetsuya Nomura online! This interview was previously published in the July 5 issue of Famitsu Weekly; however, it was not published in full. We have already translated some parts of the interview (which you can read here and here); find the rest below! Translations have been provided by KH13 Staff Mio-chan and NihonScribe, and Katie Armstrong and Keytotruth. You can read the rest of the interview in full below. 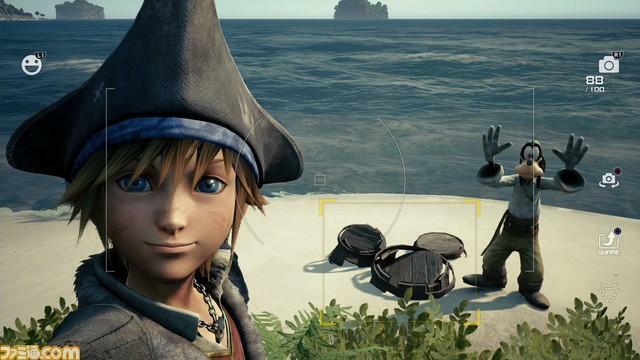 In the light of these new remarks, what are you most excited about in Kingdom Hearts III? Let us know in the comments! I understand time travel in Dream Drop Distance for the most part, but there's always been this one thing that I don't really understand. in the game, we are told that the Robed Figure passed on the ability to time travel to Young Xehanort, so that Young Xehanort doesn't have to get rid of his body or something like that. I was confused as to how you can just simply "give" someone the ability to time travel, so I looked into it. I found a Nomura interview where he says this: "to transcend time one must ‘first’ discard their form. As a result of the actions of the Brown Robed Figure, they all were in a state where they had gained the power to transcend time. The Brown Robed Figure explains the facts. 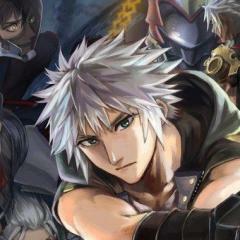 The thirteen were summoned at the same time, this time thanks to Young Xehanort who borrowed that power." What does this mean exactly? Am I the only one who has no idea what he's saying here? Could it be the translation that's making it more confusing that it actually is, because I'm not sure what he's trying to say? It seems like he's saying that they all gained the ability to time travel because the Robed Figure was Xehanort reduced to just a heart, but how does that make it so they all have the ability to time travel? Sora and Riku have both been reduced to just a heart before, but they can't just randomly time travel as they please, they need Yen Sid's magic in order to time travel. I thought that you actually need to be a heart while you're time travelling, because that's what Yen Sid said, but Nomura's making it sound like all you need to do in order to be able to time travel is you have to have been just a heart once in your lifetime. That seems way too OP. Plus, it completely contradicts what Yen Sid said. Since this is the case, it makes me believe that's not really what Nomura's saying here, so is there any other way to interpret what he's saying? EDIT: After doing some more digging, I found this in the KH Ultimania: "Discarded his body and became able to travel through time. Traveled back in time to the Destiny Islands and gave Young Xehanort some of his own power. Due to discarding his body and becoming the Robed Figure, all incarnations of Xehanort gained the ability to travel through time. However, the only ones actually able to do so were the Robed Figure and the one he had given his power to, Young Xehanort." I guess it sort of works like how Keyblades work. Just because you have the ability to wield a Keyblade, doesn't mean you have a Keyblade/doesn't mean you know how to summon a Keyblade.. Similarly, just because you have the ability to time travel, doesn't mean you can time travel/doesn't mean you know how to time travel. 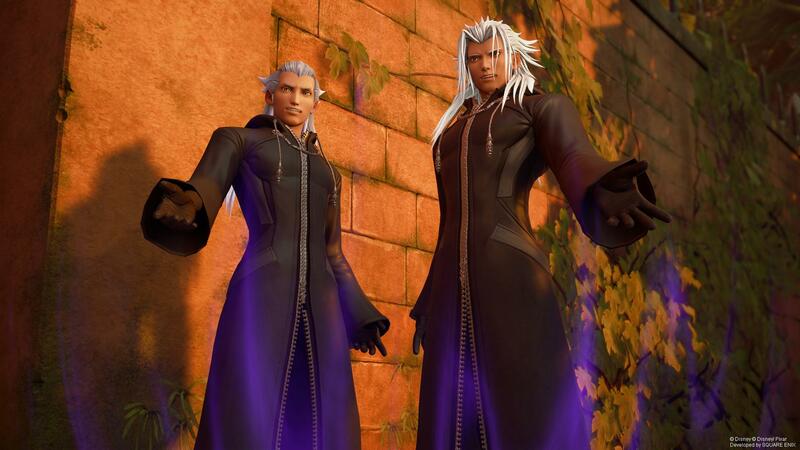 And what the game really meant by "the Robed Figure gave Young Xehanort the ability to travel through time" is "the Robed Figure shared some of his powers with Young Xehanort". So, it all makes sense...I guess? 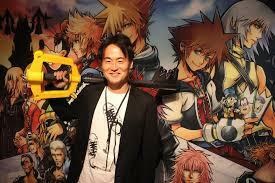 It "makes sense" in a very Kingdom Heartsy kind of way lol EDIT: Just found this interview with Nomura. What he says he throws me back into confusion: "Nomura: First off, when Young Xehanort made contact with the Brown Robed Figure, that is to say, the Xehanort who called himself Ansem, his abilities were transferred to him. As a result of Master Xehanort tossing his physical body, he was able to exceed time, and this power was carried into the Brown Robed Figure. Thus when Young Xehanort made contact with him, he gained this power. Possessing this power. Young Xehanort functioned as a “portal”, summoning Xemnas and Ansem each time they appeared. That’s why Young Xehanort was there whenever they appeared. Additionally, when Sora and Riku dropped into the worlds of sleep, simultaneously Young Xehanort himself goes into the world of sleep.' I have no idea what Nomura is saying at this point. I really really really hope this gets cleared up in KH3.